Today would have been Noah’s 24th birthday. 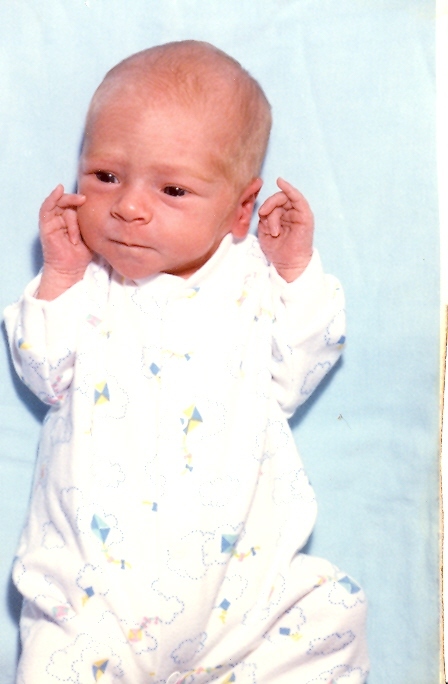 To note the occasion I’m posting a short piece from my memoir about the day he was born. Noah blinked his dark eyes. So, I chose the simple words from the Garrison Keillor song that opened Prairie Home Companion each week. I wanted to sing a line or two from the song, but the anesthesia from the emergency C-section scrambled my mind. Noah decided to arrive a month before his due date. He weighed just four pounds, nine ounces. My husband Mike traipsed into the operating room wearing surgical scrubs. The doctor and I were waiting; he was keeping an eye on Noah’s intrauterine vitals, which were weak. Time was running out and the delivery needed to begin. “There’s a toilet paper tail on your foot,” I said. He looked down and used his other foot to remove it. We laughed. “Sit right there, Mike,” Dr. Karnes said, pointing to a wheeled stool near my head. “I peeked over the top of the sheet,” Mike said to me. “I almost fainted. It was yellow and bloody,” he said about the small incision and gaping flesh hole from which they took the baby. “Thanks for sharing that,” I said. We laughed again—it was nervous laughter—we were scared by this unexpected turn of events. Time compressed, expanded and mashed up from incision to birth, like a time-lapse film. I faded in and out under the anesthesia as wavy, watery people came and went from the OR and recovery rooms. I heard familiar voices Mike, Dr. Karnes and the nurses were all talking. I didn’t know which room I was in at what time or even where Noah was. It might have been a few minutes or a few hours, I can’t say for certain. Noah was sleeping was on my chest, my head and shoulders were propped up with two pillows so I could see this brand new tiny boy. He was wrinkled and darker than I expected. His hands were clenched up near his head. There wasn’t a sign of the blonde curls that would become one of his most distinguishing features—just a few wisps of light brown hair. I rested my cheek on the top of his head; it was warm and smelled sweet and tangy, like yogurt. He looked a little troubled; a furrow lined his brow. “Don’t worry Noah,” I whispered. I would worry for him and about him, this tiny sweet creature, so new to the world, so new to us. I tried to think of something more comforting to say—but could not—so I kissed him instead. As much as I hate getting rid of the good stuff I’ve written, I’ve found revising and rewriting to be a satisfying experience. One of the most pleasant aspects of the work is revisiting older pieces of writing–pieces that were written a year or more ago. I’m sometimes surprised at how much I like them. I also can see where they are lacking detail, dialogue or logical sequence. I also find paragraphs that are odd, awkward and just don’t fit with the story I’ve written despite my fondness for them, I kn ow they have to go. I keep a document titled Excess Copy. It contains sentences that didn’t quite work, short pieces of narrative that are interesting, but don’t quite move the story along and a few half completed essays that seemed like good ideas at the time, but didn’t develop or grow quite right. So far, I’ve revised all of Noah’s life stories and one from after his death. That means I’m about halfway through the revision process. I asked my author friend, Adam Schuitema when he knew something was done–that it didn’t need more revision. He told me when his short stories are published, they’re done. I think that’s great advice and until more of my pieces find homes in literary journals or as a book, I’ll continue to revise and refine.